May's update brings you just a few of the B & G related items that have been sent in to us this year. There are so many that we have had to split them up and will post them on these pages with the next few updates. 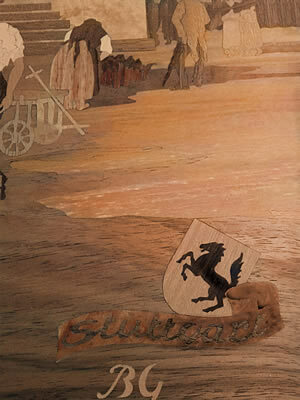 Make sure you read the stories by Charles Stevenson and Andy Edwards, they give a good insight into the world of the Buchschmid and Gretaux Wood Inlay Co.
Our May 2012 update starts with a surprising coincidence of two submissions from two different contributors of a rarely seen B & G wood inlay picture. The main picture belongs to Noreen Brown, and Noreen asked us for the best way to care for and preserve the picture. The best answer is to keep it out of direct sunlight and try to maintain a modest level of humidity in its close proximity. Do not wet it though. The second of these pictures comes from Chris Tripp who noticed the Ferrari Prancing Horse coupled with the name of Stuttgart. It's an interesting observation, and we're afraid to say, it's also a question we do not know the answer to! If anyone knows the connection with Ferrari, we would love to know the answer to this conundrum. The B & G wood inlay of St. Bartholomew's has recently been acquired by Cathy & Mark Scozzari, and we are pleased to say they are more than happy with their B & G picture. Like all owners of these works, they are enjoying an appreciating asset to their home. 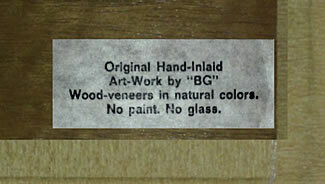 Don't forget that each and every B & G picture is unique in that, as brush strokes can't be accurately replicated in painted art works, so, veneer grain and patterns are themselves similarly unique - basically in the same manner as each set of finger prints are unique. Contributor Andy Edwards owns the B & G piece titled "Good Friends". "I acquired my B & G piece “Good friends” from a Naval Officer in his late 80’s who passed away several years ago. The Officers name was Capt Albert Vogel and he told me he had bought it in a shop while in Germany. He was as intrigued as I was with the detail and loved woodworking and fly fishing. When I purchased his house, he was very old, and I told him I wanted it, so we worked out a deal. He took everything he wanted out of the house and left me to clean the rest. This piece took a little extra money, but many other items I have are unbelievable as well. There were many awesome books from the early and mid 1800’s leather back Books from Charles Dickens, 1856, Shakespeare Complete Works 1850, and many more. Due to health problems I am now looking to sell as many of these things that I can. There are some stickers on the back of “Good friends”, I am including photos of them for you." Thanks for sharing your story with us Andy. It looks like you got quite a few pieces of very interesting art with your house purchase. Not only an excellent B & G wood inlay master-piece, but also some wonderful books from the 1800's into the bargain. You did well there Andy. by Charles Stevenson. It is an absorbing story and is well worth reading. "I met Dr. Wilhelm Heuvels of Fulda, West Germany, on two of his trips to the Azores and one to Alaska. 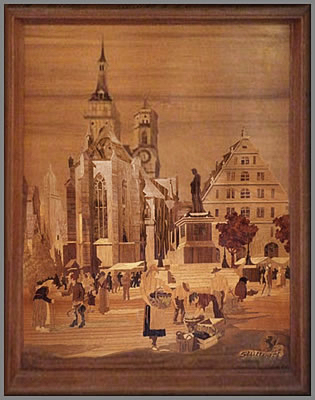 From him I acquired several B and G marquetry works including the Woodbine (binewood) coffee table, a bookworm, Heidelburg, basket of roses (large) and two rose wall panels. Dr. Heuvels was most fascinating and was the B and G sales person who visited military bases outside the continental USA. I first met him when he came to my legal office in the Azores for some assistance in translating some legal concepts from English into German. We spent a few hours on that project much of which was nuancing various terms so he could provide an accurate translation into German. My wife at the time met him separately at his display so we met again later when we purchased some of the works. Dr. Huevels was in his seventies in the 1970-72 period when I met him in the Azores. He must have been 80 or so when I again met him in Alaska in 1982. He was "doctor" because of a law degree. 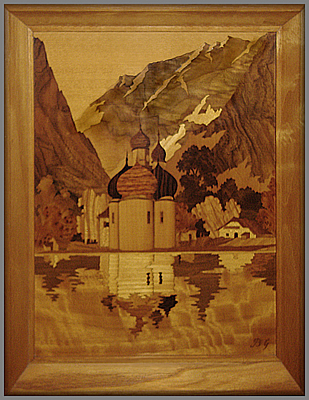 He spoke glowingly of both Buchschmid and Greteaux and, one evening when I had him over for dinner, he patiently explained the arduous process of producing a marquetry picture. He was so interesting that two small children actually behaved and listened for a long time. He was also familiar with the many woods used in the marquetry and pointed out several tropical hardwoods used in the Bookworm picture. Although he told of various vignettes of both Buchschmid and Gretaux, I do not remember many details. With all the various woods, I consider the large version of the bookworm the masterwork of the various pictures. I no longer have the ones I bought from Dr. Huevels. But I am still looking for a large flower basket or a replacement bookworm, but this has been a long search. Dr. Heuvels was an important figure to the B & G discussion as it was he who introduced these works into the American military community." Click the above button to return to page 38 of "Can You Help"